Does your church have a great website? Is it easy for you to keep your site updated? Are you happy with what you are able to do with your website? If you answered no to any of these questions, Pastor Will can help. In Church Websites for Everyone, Pastor Will will help you create a great church website and teach you how to keep it updated. Sign up now and you could have a brand new website in time for Christmas. You don’t need to be a website expert to get started. You will be introduced to Squarespace, a platform that puts professional websites within reach to churches with limited budgets and users with limited technical skills. It is also powerful enough to handle larger churches, more complex websites, and advanced users. In fact, the Rio Texas website (www.riotexas.org) runs on Squarespace. 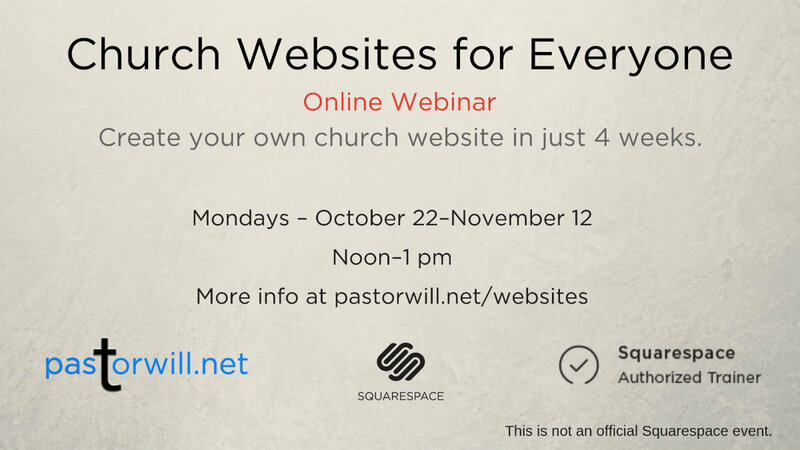 While the course is free, to launch your church website, you will need to sign up for a Squarespace package. Fortunately, if you register for Squarespace through this course, you will get a six-month trial to check out Squarespace and get your site ready to launch. You will also get 20% your first purchase. If you purchase a plan and pay yearly, that means 20% off your entire first year!